Among patients with chronic obstructive pulmonary disease (COPD), diabetes mellitus (DM) is a common comorbidity and is probably associated with increased systemic inflammation and worse prognosis. Metformin, with its pleiotropic anti-inflammatory and antioxidant actions, may offer theoretical benefits in COPD patients with DM. Thus, this study aimed to investigate the effects of DM and metformin use on mortality in the clinical trajectory of COPD. This was a retrospective cohort study comprising patients with spirometry-confirmed COPD and an age of ≥40 years from 2008 to 2014. The primary outcome of interest was all-cause mortality. We evaluated the effects of DM on mortality through the clinical course of COPD and we also assessed the impact of metformin use on survival of the COPD population. Among 4231 COPD patients, 556 (13%) had DM, and these patients had 1.62 times higher hazards of 2-year mortality than those without DM (95% confidence interval [CI], 1.15–2.28) after adjusting for age, gender, COPD stage, comorbidities and prior COPD hospitalization. Over a 2-year period, metformin users had a significantly lower risk of death (hazard ratio, 0.46; 95% CI, 0.23–0.92) compared with non-metformin users in patients with coexistent COPD and DM. Moreover, metformin users had similar survival to COPD patients without DM. This study shows that DM is associated with an increased risk of death in COPD patients and metformin use seems to mitigate the hazard. Our findings suggest a potential role of metformin in the management of DM in COPD. The online version of this article ( https://doi.org/10.1186/s12931-019-1035-9) contains supplementary material, which is available to authorized users. Chronic obstructive pulmonary disease (COPD) is one of the most important global health problems that affects 380 million individuals worldwide . COPD is characterized by persistent airflow limitation that is usually progressive and associated with an increased chronic inflammatory response in airways and lungs to noxious gases and particles . In addition to pulmonary abnormalities, COPD is considered a systemic inflammatory disorder that exerts a variety of effects on extrapulmonary tissues and organs . In the past 2 decades, the approach towards patients with COPD has shifted from nihilism to viewing it as a preventable and treatable disease [2, 4]. Comorbidities contribute to the overall severity in individual patients and also play an important role in the prognosis of COPD [2, 5]. In fact, the presence of almost all comorbidities has increased in the COPD population, particularly in those that are smoking-related, and one-half of the increased healthcare utilization and costs found in COPD patients are attributable to these comorbidities . Diabetes mellitus (DM) is a recognized clinical entity for more than 2 centuries. Over the past 30–40 years, the treatment modalities available for patients with DM and patient outcomes have dramatically improved. Despite medical advances, the global prevalence of DM has continued to increase and will reach an estimated 4.4% by 2030 . DM is a common comorbid condition in patients with COPD and is probably associated with increased systemic inflammation and poor outcomes [5, 8, 9, 10]. However, some data suggest a positive effect related to DM in COPD. A recent systematic review found that DM is associated with better short-term survival following COPD exacerbations . The protective effect is mirrored in a cohort study by McGhan et al. 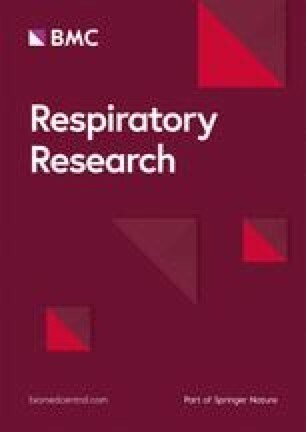 who showed that DM is associated with a decreased risk of rehospitalisation after an COPD exacerbation . To date, the protective effect of DM on COPD and its mechanism resulting in such beneficial outcomes remain uncertain. Preferential care of DM patients could represent a contributing factor, or hypothetically, antidiabetic agents used to control hyperglycaemia may modify the clinical course of coexistent COPD and DM. Metformin, which is a widely available oral antidiabetic medication, is the recommended first-line treatment for type 2 DM and is associated with a reduced risk of cardiovascular events and death . Metformin possesses pleiotropic anti-inflammatory and antioxidant actions and may play a role in patients with COPD and DM besides its glucose-lowering effect [14, 15]. .An animal study has provided evidence that metformin reduces glucose flux across the airway epithelium to limit bacterial growth in the presence of hyperglycaemia , a risk factor for increased exacerbation frequency and poor outcomes from COPD exacerbations [17, 18]. Clinical observations also indicated that metformin use is associated with increased inspiratory muscle strength and improvements in dyspnoea, health status, and lung function in patients with both COPD and DM [19, 20]. Thus, metformin may potentially offer theoretical benefits in COPD patients with DM. In this regard, we designed a retrospective cohort study to assess the effects of DM and metformin use on all-cause mortality in the clinical course of COPD, controlling for common confounders accompanying COPD and DM. This was a retrospective cohort study conducted at the National Taiwan University Hospital (NTUH), a 2600-bed tertiary-care referral centre in Taiwan. The medical records from the Integrated Medical Database, National Taiwan University Hospital (NTUH-iMD) from March 2008 to December 2014 were used in this study. The NTUH-iMD database contains all information, such as demographics, diagnosis, pharmacies, procedures, laboratories, clinical patient notes, nursing notes and death records, of inpatient and outpatient visits to the NTUH since 2006, and is maintained up-to-date by the NTUH. We identified individuals with COPD, defined by the presence of airflow limitation (proportion of the forced vital capacity exhaled in the first second [FEV1/FVC] < 0.7) and aged ≥40 years. The index date was defined as the date of receipt of the first diagnosis of COPD. Patients were generally assessed and treated based on the contemporary Global Initiative for Chronic Obstructive Lung Disease (GOLD) guidelines [4, 21]. The study protocol was approved by the Research Ethics Committee of the NTUH (201707080RINA). 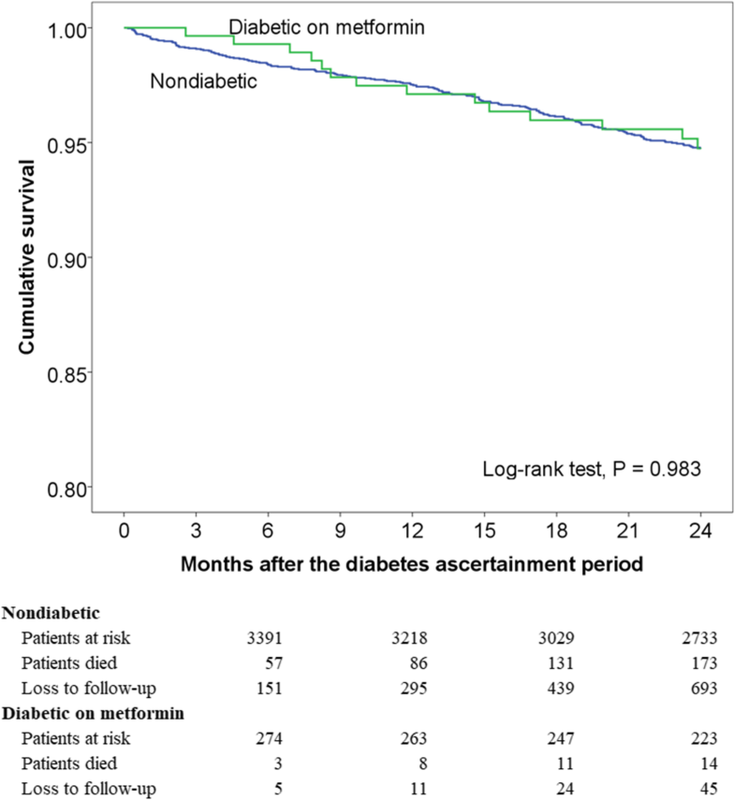 From the index date, a 1-year diabetes ascertainment window was created to classify patients with COPD into those with or without DM as a comorbidity. The diagnosis of incident and prevalent DM was established by either of the following criteria during the diabetes ascertainment period: (a) International Classification of Diseases (ICD) codes for DM plus a prescription of oral antidiabetics or insulin; or (b) ICD codes for DM plus a fasting blood glucose level of ≥126 mg/dl, a random blood glucose level of ≥200 mg/dl or a haemoglobin A1c (HbA1c) value of ≥6.5%. Patients with a diagnosis of type 1 DM were excluded from the study. 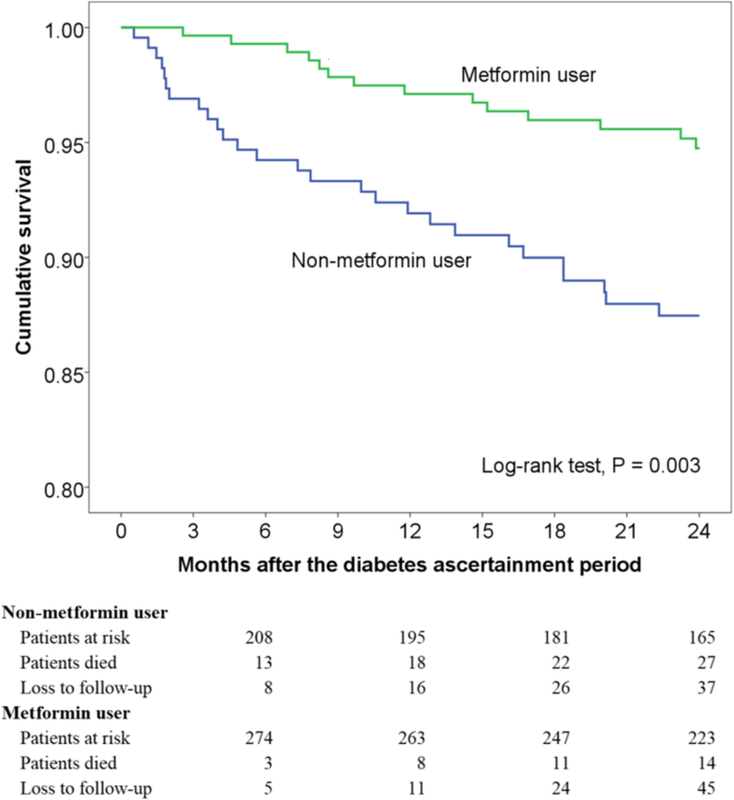 Metformin use was recorded from the prescriptions filled following the diabetes ascertainment period and was classified as follows: if patients were using metformin within 30 days after the end of the ascertainment period, they were categorized as metformin users over the follow-up period in line with the principle of intention-to-treat analysis. We excluded study subjects with chronic kidney disease (CKD) stage 3b or higher from the metformin analysis because it is a relative contraindication to the use of metformin and may confer a confounding effect . Data regarding the following known risk factors associated with long-term outcomes in COPD and potential confounders were obtained: age, gender, body mass index, hypertension, cerebrovascular disease, heart failure, coronary artery disease, malignancy, CKD, FEV1, and the number of hospitalization within 1 year after the index date . Data on HbA1c values and number of antidiabetic classes used were also collected . The CKD stages were classified as suggested by the National Kidney Foundation Kidney Disease Outcomes Quality Initiative and the Kidney Disease: Improving Global Outcomes . The COPD stages were determined using the GOLD criteria in 2013 . The primary clinical outcome was all-cause mortality, which was evaluated beginning at 1 year after the index date until 3 years after the index date, i.e., the 2-year period beyond the diabetes ascertainment window (Fig. 1). An advantage to this approach was the minimization of the potential for immortal time bias by fixing DM status before the outcome ascertainment period . 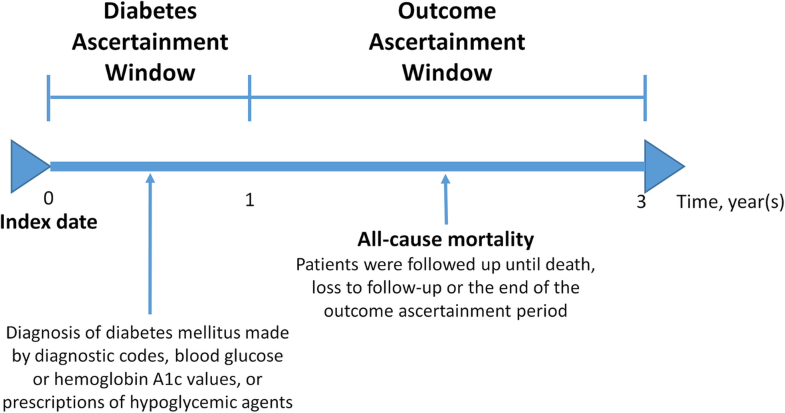 Patient survival status was determined as the time to death from the end of the diabetes ascertainment window to the date of death, time to the end of the outcome ascertainment window for a maximal total of 2 years for the survivors, or time to the last follow-up date for subjects lost to follow-up before the end of the outcome ascertainment window. Death of the patients was ascertained by death certificates in the NTUH-iMD database. The loss to follow-up was defined as ≥3 months late for a scheduled visit and not yet classified as dead. Data were primarily analysed using the SPSS software (Version 20.0; IBM Corp., Armonk, NY, US), and the statistical significance was set at P < 0.05. The comparisons of characteristics between COPD patients with and without DM were compared using the chi-square or Student’s t-test, as appropriate. Univariate Cox regression analysis with all-cause mortality as the outcome was used to calculate crude hazard ratios (HRs) for DM, age, gender, BMI, GOLD stage, comorbidities of interest and prior COPD hospitalization. Multivariate Cox regression analysis was performed with all-cause mortality as the outcome variable predicted by DM status. All covariates were entered into the final model without model selection. The survival curves were plotted using the Kaplan-Meier method and compared using the log-rank test. The effect of metformin on time to all-cause mortality during the 2-year follow-up period was analysed using survival analysis and Cox regression modelling in a similar manner as described earlier. Schoenfeld residuals was used to test the assumption of proportional hazards for variables in the final model using the Stata software (Version 11; StataCorp, College Station, TX, US), and global test P > 0.05 indicated no violation of the assumption. We also used competing risks regression to analyse the effect of metformin on all-cause mortality, treating loss to follow-up as a competing risk via the stcrreg function in Stata. A total of 5597 patients with spirometry-confirmed COPD were identified between March 2008 and December 2014. Of those, 4231 subjects had at least 1-year follow-up period from the index date of COPD diagnosis to identify accurately the DM status. Baseline demographics and clinical features are displayed in Table 1. The mean age was 72.0 years (standard deviation, 10.4 years), and 83% were men. The male predominance in this study was similar to a recent national epidemiology survey of COPD patients in Taiwan . Of the 4231 patients, 556 (13%) had DM (Additional file 1), and they were older than patients without DM. With regard to comorbid illnesses, DM patients were more likely to have hypertension, cerebrovascular disease, heart failure, coronary artery disease, malignancy, and CKD. No significant differences were observed between the two groups in the distribution of GOLD stages or the number of hospitalization within 1 year after the index date. 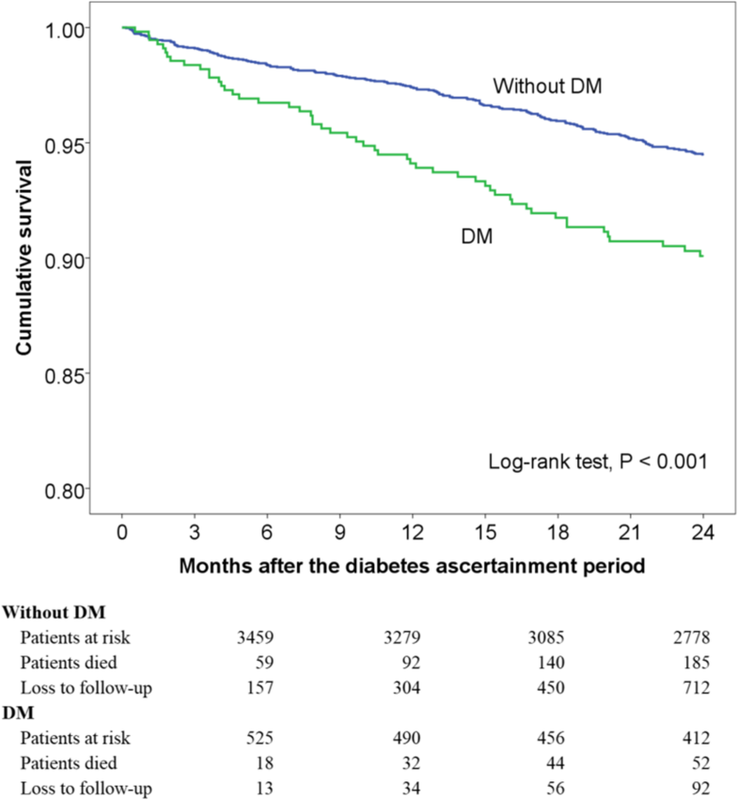 Within 2 years after the diabetes ascertainment period, COPD patients with DM had a higher probability of mortality than those without DM (P < 0.001; Fig. 2). Adjusted HRs for the Cox regression model with mortality in the 2-year follow-up period as the outcome are shown in Additional file 2. After adjusting for age, gender, GOLD stage, comorbidities, and prior COPD hospitalization (global test P = 0.305), patients with DM had 1.62 times higher hazards of 2-year mortality than those without DM (95% CI [confidence interval], 1.15–2.28; P = 0.006). Of the 556 patients with DM in this study, 45 were excluded because of CKD stage 3b or higher, a relative contraindication to metformin use, to eliminate the potential confounding effect. Of the remaining 511 COPD patients with DM, 282 received metformin, and 229 received other antidiabetic agents (Additional file 3) at the initiation of the 2-year follow-up period. Patients on metformin had significantly lower mean age and proportion of heart failure and malignancy (Table 2). During the 2-year follow-up period, patient survival was significantly better in metformin users by using the log-rank test of Kaplan-Meier survival curves (P = 0.003; Fig. 3). In a Cox regression model controlling for age, gender, GOLD stage, comorbidities, prior COPD hospitalization, and number of antidiabetic classes (global test P = 0.660), patients in the metformin group had 0.46 hazards of death compared with those in the non-metformin group (95% CI, 0.23–0.92; P = 0.028; Additional file 4). When loss to follow-up was accounted for as a competing risk, a lower risk of death (HR, 0.46 [95% CI, 0.23–0.91]; P = 0.025) remained in metformin users compared to non-metformin users. Subsequently, the 282 DM patients on metformin during the 2-year follow-up period were compared to the remaining 3599 COPD patients without DM. Patient mortality was not significantly different between the two groups in the log-rank test of the Kaplan-Meier survival curves (P = 0.983; Fig. 4). In the Cox regression model controlling for age, gender, GOLD stage, comorbidities, and prior COPD hospitalization (global test P = 0.254), DM patients being placed on metformin had no difference in hazards of death compared with COPD patients without DM during the follow-up period (HR, 0.98 [95% CI, 0.56–1.69]; P = 0.927; Additional file 5). The most prominent findings of this study are that (a) COPD patients with coexistent DM had a significantly higher hazard of death during a 2-year follow-up period than those without; (b) metformin use was associated with a favourable outcome in terms of all-cause mortality among patients with COPD and DM; (c) metformin appeared to reverse the adverse prognostic effect of DM on survival in COPD patients. In short, our data suggest that metformin, if not contraindicated, may be the drug of choice for the treatment of DM in the presence of COPD. In a study including patients with COPD exacerbations and DM, metformin use was associated with a survival benefit although potential confounders were not properly accounted for in the analysis . A recent work using a nationwide claims database by Yen et al. further proved that a lower risk of mortality was observed for metformin users despite acknowledging inherent drawbacks of insurance database, such as lack of information on BMI, pulmonary function tests, and renal function in patients with DM and either stable or exacerbated COPD . Another clinical study also showed that metformin use in patients with coexistent COPD and DM is associated with lower healthcare utilization, defined as emergency room visits and hospitalization . Moreover, a prospective observational study demonstrated that metformin improves the symptomatology and functional status among COPD patients with DM or impaired glucose tolerance . In line with the aforementioned findings, the present large-scale study provided further evidence that metformin users had a better survival outcome than non-metformin users after adjusting for relevant observable characteristics in patients with COPD and DM. The plausible biological explanations for the beneficial effects of metformin in the coexistence of COPD and DM are not clearly understood but may involve its pleiotropic features. Via a variety of signalling pathways, metformin is reportedly able to inhibit anti-transforming growth factor-β-induced lung fibrosis, to attenuate oxidative stress and pro-inflammatory cytokine responses to reduce airway inflammation and remodelling and to enhance or maintain the expression of anti-inflammatory cytokines [31, 32, 33]. In addition, skeletal muscle dysfunction is a common phenomenon in patients with COPD or DM [34, 35]. Metformin, through mediating activation of adenosine monophosphate-activated protein kinase, improves mitochondrial biogenesis and function to increase glucose disposal and muscle glycogen concentrations and consequently enhances muscle function [36, 37]. Taken together, despite the background mechanisms remain to be elucidated, clinical and experimental evidence indicates that metformin, an inexpensive, off-patent, and widely used antidiabetic drug, is a reasonable and viable choice for COPD patients with DM. Evidence indicates that DM as a comorbidity is associated with disease progression and worse prognosis of COPD patients because of its adverse effects on lung anatomy and physiology, inflammatory responses, and antimicrobial defenses . In consistency with these findings, the present study found that COPD patients with DM had a significantly higher hazard of 2-year mortality compared with those without. Furthermore, recent evidence supports that COPD is an important risk factor for the development of DM [38, 39, 40]. Thus, it has been advocated that targeted surveillance and intervention measures for DM are needed in the clinical care of COPD patients although this strategy is not recommended in the current practice guidelines of COPD [2, 10, 39]. Notably and interestingly, our study added to the existing knowledge by showing that COPD patients with DM and receiving metformin had a similar hazard of death to COPD patients without DM. The finding suggests that metformin use in patients with coexistent COPD and DM may even reverse the negative prognostic impact of DM on COPD outcomes. This study has a couple of limitations. First, the relationships between chronic systemic diseases are complicated. Whether beneficial outcomes of metformin are due to its favourable glucose homeostasis action, protective effects on the cardiovascular system, or direct influence on the natural course of COPD remains uncertain and is beyond the scope of this study. However, we observed a survival advantage associated with metformin use even after controlling for important clinical confounders. Second, the study findings from a single site, thereby eliminating variance in clinical practice and availability of medical resources, may not be generalizable to other institutions or settings. Yet, as a large study to date demonstrating the survival benefit of metformin among COPD patients, we hope that our report will draw attention to this specific patient population and encourage more studies to investigate this issue across a variety of research settings. In summary, this study shows that DM as a comorbidity is associated with an increased risk of mortality in patients with COPD after adjustment for age, gender, GOLD stage, comorbidities and prior COPD hospitalization. Our analysis further indicates that metformin use was associated with lower hazards of death among patients with coexistent COPD and DM, and may mitigate the negative prognostic effect of DM on COPD, suggesting the potential role for this agent in the management of DM in the setting of COPD; however, prospective randomized studies are needed to validate and confirm our results. We thank the staff of the eighth Core lab, Department of Medical Research, National Taiwan University Hospital for technical support during the study and we also thank the staff of the Department of Medical Research, National Taiwan University Hospital for the integrated medical database (NTUH-iMD). This study was supported in part by a grant from the Ministry of Science and Technology, Taiwan (MOST 108–2634-F-002-015). CTH made substantial contributions to conception and design, acquisition of data, analysis and interpretation of data, and was involved in drafting the manuscript. TWH, YJT, and ASYL contributed substantially to the study design, data analysis and interpretation, and the drafting of the manuscript. FL and CJY contributed substantially to the study design and data interpretation, and was involved in revising it critically for important intellectual content. All authors read and approved the final manuscript. The study protocol was approved by the Research Ethics Committee of the National Taiwan University Hospital (201707080RINA) and informed consent was waived because of the retrospective nature of the study.